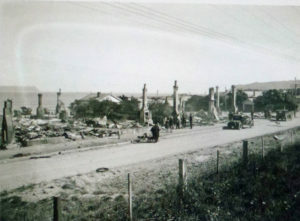 Until the 1960s Plimmerton suffered many devastating fires. 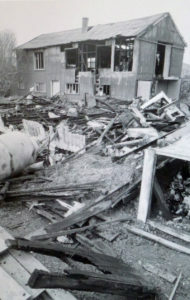 Accommodation houses, private homes, community halls and shops were lost. Locals established a volunteer fire brigade in 1934 but with no fire appliance or reticulated water their early efforts were limited. From the time the railway service reached Plimmerton in 1885 (See site 12: Plimmerton Railway Station) the area was promoted as a seaside holiday and picnic spot. Accommodation was needed for the many visitors who came from Wellington and Palmerston North during the summer months. 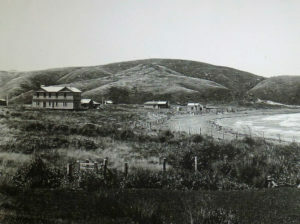 Large wooden boarding houses were built near the station and beach. Holiday cottages and shops appeared in increasing numbers along the shoreline. Plimmerton House shortly after it was built in 1894. The railway station is nearby at the edge of the photo. Over the years the village suffered a number of devastating fires and had no effective means to fight them. It was a case of evacuating the people and removing as many items of furniture and belongings as possible. In 1934 a group of local men established the first fire brigade (See site 20: Fire Brigade/ Station) but they were limited in what they could do when a blaze took hold of a building. It was 1945 before they had the means to buy their first motorised fire engine and reticulated water did not arrive until the late 1950s. Given the difficulty of dealing with the fires, it is amazing no lives were ever lost. 1923 Steyne House: Earlier known as Erenora, Steyne House was a two-storeyed boarding house where the large block of flats now stands in Steyne Avenue. (See site 16: 7 Steyne Avenue) The owner, Mr Wally Barlow, was cooking an early breakfast when he heard a bang upstairs. He discovered a fire and evacuated the boarders, many of whom had been asleep. One boarder was Miss Rayne, a teacher at the school. At least one report says she jumped from the upper storey. 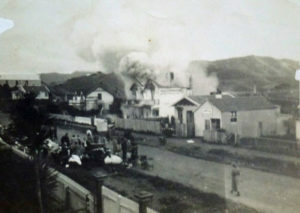 Sollit’s boarding house near the little park on the Steyne Avenue was believed to be the starting point of a most devastating fire. 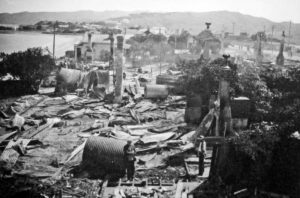 This fire, Plimmerton’s biggest blaze, spread through eight houses and the beach shop leaving only their chimneys in its path was. With no fire brigade or reticulated water, there was little the locals could do. Chimneys still standing after Plimmerton’s biggest blaze. 1930 Seaview Boarding House: Sollit’s boarding house near the little park on the Steyne Avenue was believed to be the starting point of a most devastating fire. This fire, Plimmerton’s biggest blaze, spread through eight houses and the beach shop leaving only their chimneys in its path was. With no fire brigade or reticulated water, there was little the locals could do. 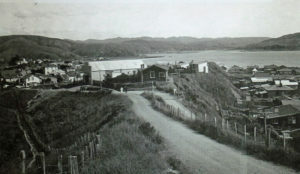 1932 Taupō Hall: The popular Taupō Hall was built on the lower part of Motuhara Road in 1924 by a company of local men. It was used for movies on Wednesdays and Saturdays. A large generator powered the lighting and projector until electricity arrived in 1925. For a number of years the All Blax Minstrels, a group of local entertainers, held very popular concerts in the hall. It was also used regularly for dances as it had a particularly good floor, and for school concerts. This was a big loss to the community when it burnt down late one night in 1932. Again with no fire brigade or water, there was nothing anyone could do. 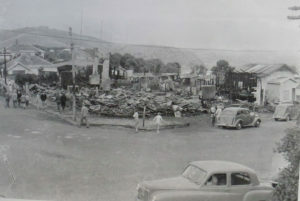 1954 Shopping area and Theatre Royal: Early one Sunday morning in February fire destroyed many of the shops at the north end of Steyne Avenue. Casey’s butchers’ shop, Purvis’s hairdressing, Miss Cumberworth’s grocery and drapery and the Theatre Royal were all destroyed. Fire engines were called from Wellington and other areas to assist the Plimmerton brigade. 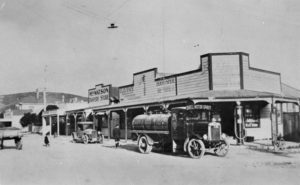 As Plimmerton still lacked reticulated water the pumps were run onto the beach. When the spring tide receded quickly firefighting had to stop while the pumps were moved down the beach. Sand was sucked into one pump and had to be cleaned out. While all this was happening the fire spread rapidly. By the time it was under control again the vehicles had sunk in the soft sand and, with the tide rushing back in, they had to be towed rapidly up the beach. Loss of the shops was a major issue for the community. Local ‘tradies’ banded together and with donations of money and materials built the new (currently existing) retail block in six weeks. 1963 Furniture Factory: When the furniture factory in School Road caught fire it stored highly flammable items including dry wood, varnish and lacquers. The blaze was exceedingly hot and spread to a nearby bleach factory which was full of chemicals. Once the fire was out the chemicals were taken to the tip in Airlie Road not far from the railway line. Later in the day toxic fumes rose from the tip and train services had to be suspended for a time.